Punjab Education Development Board (PEDB) has recently given a notification of 02 Manager Finance and Assistant Manager Jobs on the contract basis. The interested candidates can attend walk-in-interview for the Punjab Education Development Board Recruitment 2018 on 27 June 2018. SSA Punjab Recruitment 2018-19 notification is out. As per the Notification, there are 02 Manager Finance and Assistant Manager Vacancy. The educational qualification is as per the department rules. The maximum age limit is 62 years. If you are looking for Govt. Jobs in Punjab Education Board then this article is going to be very helpful for you. Manager Finance: The candidates must be a SAS card holder and retired from the Punjab Government. The candidates should have 05-years of experience as Section Officer. Assistant Manager: The candidate should be retired from the Punjab Government as Senior Assistant/Superintendent of at least 15 years. Note: The candidate should have passed the Punjabi up to matriculation level. You can attend walk-in-interview for these vacancies on 27.06.2018 at 10.00 AM in this office. Bring your application form at the time of interview. 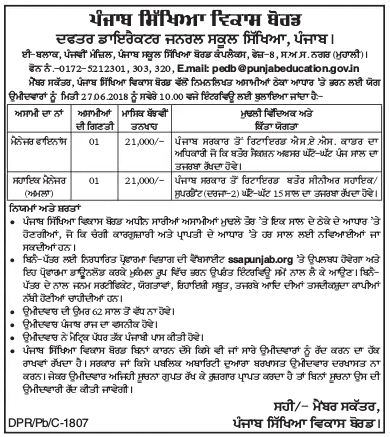 Punjab Education Development Board, Office of the Director General School Education, Punjab, B-Block, 5th Floor, Punjab School Education Board Complex, Phase-8, S.A.S Nagar (Mohali). Dates of Interview: 27 Jun 2018 at 10.00 AM.